Sherrie Scraps with passion: Friends Forever! Happy Monday~I hope you all had a wonderful weekend!!! It was gorgeous pretty much all weekend here...... in the mid 70's! It was awesome :) I spent a lot of time outside getting some projects done while my hubby worked on packing and getting ready for his annual fishing trip to Canada. I was able to get the deck stained and now working on the gazebo. Hopefully, as long as the weather continues to cooperate.... I should be done by tomorrow! Yippee! Pretty Paper Pretty Ribbons called Birthday Panda. It's so stinken cute, ha??? I started with a black card base, followed by a base layer panel cut at 4 4 1/2. The background chevron paper is from MME. I also added an additional black panel near the bottom and with a Martha Stewart punch added a fun border. I heat embossed the sentiment with My Creative Time's~Treasured Moments stamp set. 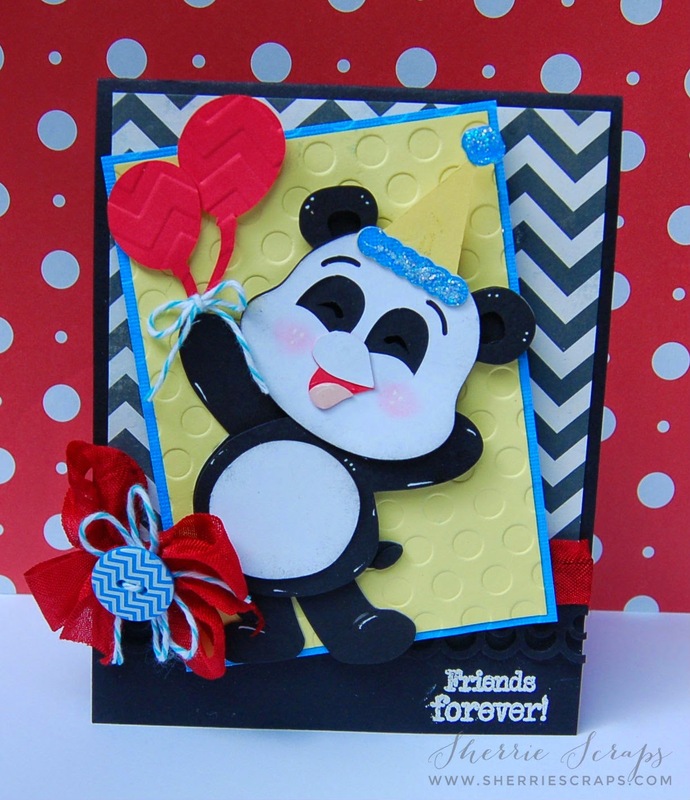 The adorable panda was cut at 3.98 plus the layers and popped this cutie up on a yellow panel which I embossed with the dots folder. I used the negative side and with pop dots adhered the panda in place. I needed a little more pop so I cut another panel of blue just a little bit larger then the yellow. I cut a balloons at 2 1/4 and 2 1/2 from the Birthday Bash cartridge. I embossed them with the SU chevron folder and tied on some fun Caribbean twine and tied a bow. For the inside of my card, I used My Craft Spot's Big Words metal die set for the Happy Birthday and the fun little enamel dots in the corner are from my sweet friend Carri :) I finished with a red crinkle ribbon bow using ribbon from my sweet friend, Karen at Little Scrap Pieces and a fun chevron button I picked up at Michael's. Sherrie this is a super duper cute card. Love the image.The papers are fabulous and the embossing really pops. Love it my friend. Have a creative day. Oh my gosh, how stinkin' adorable is this, Sherrie!! I love, love the panda!! My sister collected pandas when we were growing up so they hold a special place in my heart!! The embossing is fabulous!! What a fun and festive card!! Love, love it!! 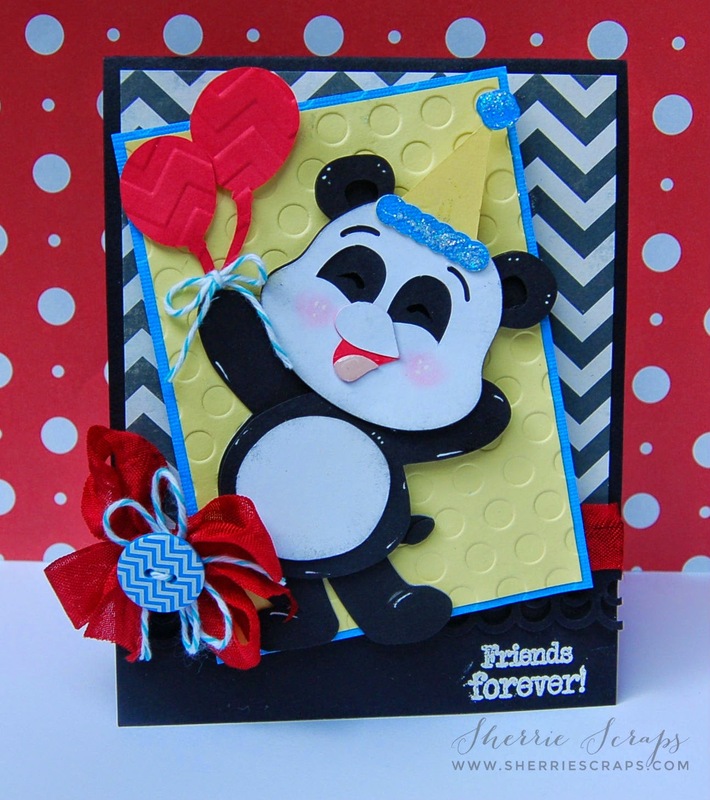 Your card is so adorable Sherrie, I love the panda and the BIG birthday wishes sentiment. The colors are super. I say the 3rd time is a charm you will be fine this year. I am keeping you in prayer. What a sweet, sweet card - I love that Panda! I also love the great colors you used, everything just pops! Yay for finding a bit of crafty time! Sounds like you are getting a lot accomplished - hoping the weather holds out for you! Don't work too hard! Aw love love that Panda, he looks so happy there.... Awesome chevron papers and embossing folder too! So cuteSherrie! That little bear just makes you smile when you look at him! Love the chevron paper . Sooooooooo cute! LOVING the panda and the colors!!!!!!!! This is an adorable card! I love the panda!!! The colors are fun and fresh and love that chevron paper! This is SO cute, Sherrie! I LOVE the de-bossed background! Such wonderfully bright colours too! I hope your husband has a fabulous time in Canada - and that there are no floods while he's gone! I love your Panda card!! TOTALLY cute & SUPER duper cute!! Ok, deck staining is one of those things I will just hire someone for. Ugh! My hat is off to you sista! Your card is just the cutest, and I love the de-bossed background! Cute cute cute! Sherrie, this card is absolutely adorable! What a precious little bear... he's just so happy! :o) I love the embossing and de-bossing and of course all of the fun trims! :o) The colors just pop right off of the black and white background. :o) And of course the interior is marvelous, as well! Gotta love those big words dies. :o) This is positively delightful! And congrats on getting so much accomplished at home! YAY! You go, girl! :o) Have a happy, sparkly, beautiful Wednesday, my dear friend! What a adorable card!! I Love the sweet panda!!! 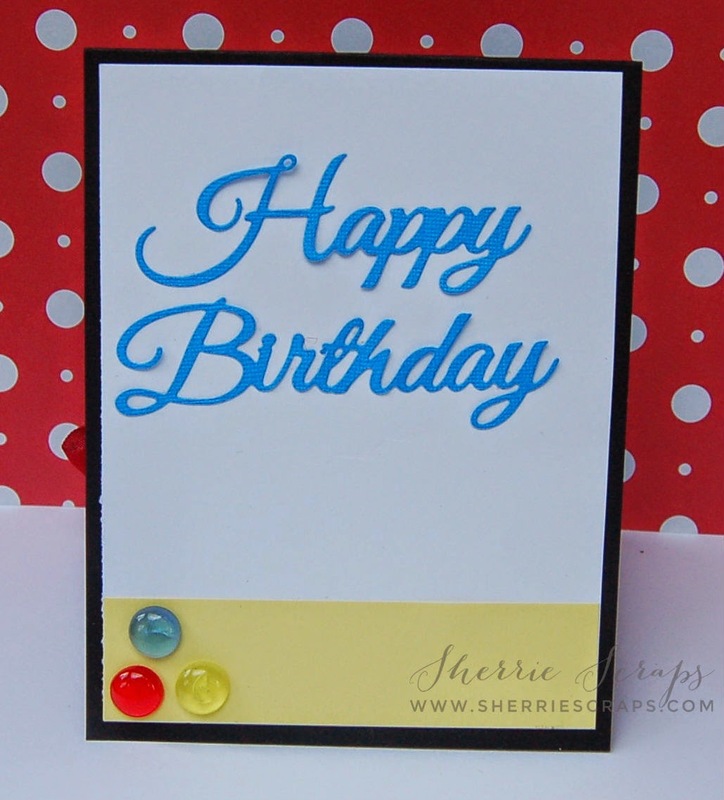 Sherrie this card is so fun, I really like how you angled the papers and the embossing! This is soooo fun , and soo cute !!!!! I love this adorable card !!! Hope you have a wonderful day !! Such a sweet card. Hope you have a great weekend!! Popping by again to wish you a happy weekend!! Hope all is well with you! I have looked at this adorable bear numerous times and I can not believe I haven't left you some crafty love! He is fabulous! The chevron, the embossed dots, the bow, the white sentiment...I like it all! Sherrie ~ Seriously ADORABLE!! 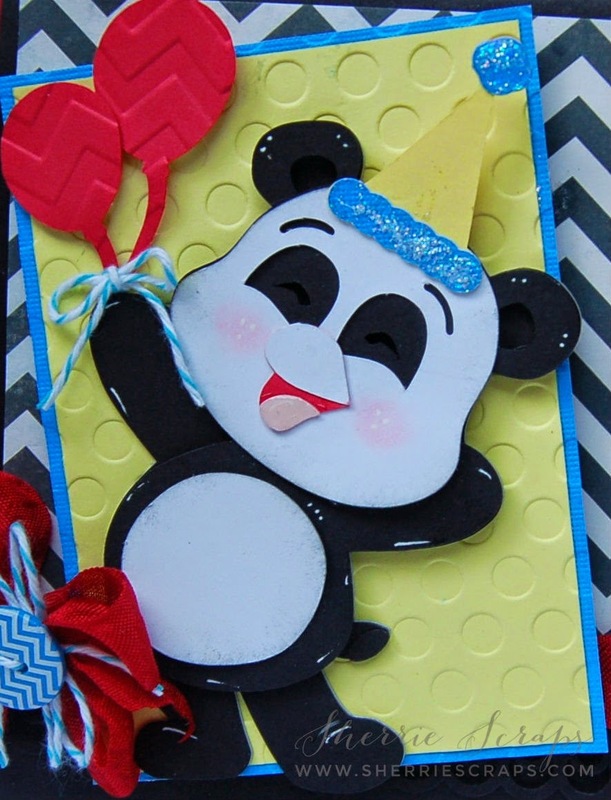 I LOVE that panda and he or she looks so excited about celebrating a birthday! Too CUUUTE! This is too adorable. Love panda's.